Click here to read about Australia's early explorers, starting with William Janszoon in 1606, the sections they all mapped (and didn't map), where they came from, and where they sailed to. The population of Australia at the time of its "invasion" by England in 1788 is estimated at perhaps being about 1 million though it may well have been less. The population around the Sydney region was estimated as "about 1500". From the beginning, instructions from England were to "establish good relations with the Indigenous people" in order to "gain useful knowledge of the area", and all reports of Governor Phillip show that, yes, he endeavoured to do just that, ordering that the Aboriginal peoples must be "well-treated, and that anyone killing Aboriginal people (without due cause - Steve) would be hanged". But in 1791, Governor Phillips handed out muskets to ex-convict settlers, to "shoot at" aboriginals, and inevitably settler and government retaliation against aboriginal attacks led to unpunished massacres. On the other hand, starting with Governor Macquarie on 4th May 1816, click here for the attempts at peace by the British Government in Sydney and in the other colonies during these early years by establishing "protected reserves". Click here for recent developments. No, no simple answers about how people can live together, particularly when they have different cultural backgrounds — James 4. Not without God's help. Anyway , beginning in 1788 all the initial settlements in Australia were ruled from Sydney as penal settlements or "prison camps", with land grants and leases offered to convicts as they completed their sentences. Each Governor was empowered to grant land to these men. Every male was entitled to 30 acres, an additional 20 acres if married, and 10 acres for each child with him in the settlement at the time of the grant. To encourage free settlers to the colony, Governor Phillip received additional Instructions entitling non-commissioned Marine Officers to 100 acres and privates to 50 acres over and above the quantity allowed to convicts. Other settlers coming to the colony were also to be given grants. Click here for historical maps of the boundaries of each colony. Note that Van Diemen's Land (Tasmania) was assumed to be part of the mainland until 1798, when it was discovered to be an island. Click here for some background on what was being used for money. There were no (or minimal) land sales before 1831. Transportation to Sydney ended in 1840 as the colony opened up to free settlement, land sales (by auction), and subdivision. Self-government in New South Wales came in 1855. Independent colonies opened up under British rule, starting with Hobart in Van Diemen's land in the south in 1825. About 80,000 went to Sydney during the years 1787-1840, with a number ending up at Moreton Bay-about 2400, and Norfolk Island (click here for some history)-about 6400. After Moreton Bay (Brisbane) was closed in 1838, most serving convicts returned to Sydney. Norfolk Island closed for the first time in 1814, reopened in 1824, and closed permanently in 1855, with serving convicts on both occasions sent to Hobart. About 75,000 were sent to Hobart starting in 1802 up until 1852. There were two small shipments of a few hundred in 1802 and 1812, then yearly transfers of a few thousand began in earnest in 1816. Thus the number of serving convicts in Van Diemen's Land rose from just over 400 in 1816, to a peak of over 30,000 in 1847. Thereafter numbers declined rapidly, especially following the cessation of transportation in 1852. By 1862 only just over a thousand serving convicts remained. And about 9,000 went directly to Perth in Western Australia during the years 1850-1868. A database of 123,000 names has been located of the British transportation registers, and is available for downloading from data.gov.au. If you wish, click here to download it as a compact .csv file that opens in Excel, sorted by transportation year. It shows just the convict name and initial destination. Over the waters from Sydney in 1834, James Busby, the official British Resident in New Zealand, drafted a document known as the "Declaration of (sovereign) Independence" of New Zealand, under the protection of the British Crown, which he and 34 northern Maori chiefs signed at Waitangi on 28 October 1835. Back in 1769-1770 James Cook, followed by English missionaries, had started transcribing the Maori language into the English script, a development embraced enthusiastically by Maoris during the 1820s. By 1839, 52 chiefs had signed. In 1840, the Treaty of Waitangi, that ensured future land sales always had to go via the Crown, meant New Zealand was now a British colony then in 1853 a self-governing British colony alongside New South Wales. Click here for further background to this document. Now in 1862, the first electric telegraph line was built, starting at Christchurch in the South Island. In 1872 it reached Auckland, then in 1876 a submarine cable was laid to Sydney, and thus to the rest of the world. Back to Australia. Federation in 1901 now declared Australia's colonies to be self-governing states inside the Commonwealth of Australia, with the Australian constitution recognising the principal of "separation of powers" i.e. having three branches of government 1. Parliament: Making laws, with Parliament always subject to the Constitution 2. Prime Minister and the Cabinet: Enforcing laws 3. High Court Judges: Interpreting laws in light of the Constitution. The Constitution cannot be changed by an Act of Parliament alone, a referendum of the people is necessary. Click here for further background to this Australian system of government. In 1942, Australia changed its status from that of a "dominion" inside the British Empire to that of a "member" inside the British Commonwealth of Nations. In 1946, England dropped the word "British" in reference to this statutory body, in preparation for upcoming independence and membership by the Republic of India. In 1948, the issue of becoming an Australian citizen, and having an Australian passport, arose. Prior to 1947, all peoples who lived under British protection by descent in the Commonwealth of Nations, including indigenous peoples in India and Australia, were entitled to British citizenship and to a British passport. This situation could no longer apply to subjects in the brand new Republics of India and Pakistan, at that time suffering from partition, population transfer, and violence. Interestingly, an earlier move by the Irish Free State in 1924 to issue an Irish passport had deleted those two words "British Subject". This fact had made their passports unacceptable to British Consular and Passport officers worldwide when Irish citizens were wanting to enter, say, Australia, Canada, or New Zealand, with replacement passports, say from Belfast, necessary. Each member country click here in this new Commonwealth of Nations, Australia, Canada, New Zealand etc (but not Ireland) now put in force local citizenship laws. On January 26 1949, Australia's first Minister of Immigration, Arthur Calwell, declared that all people who were British subjects (or people naturalised as British subjects) would now automatically become Australian citizens, provided they had been living in Australia for five years prior to that date. Rules have changed somewhat since. The other situation of being an Australian citizen and choosing to become a British subject was then permitted by the UK up to January 1983, but rarely since. Click here for the latest rules on Australian citizenship. Click here regarding Australian citizenship and indigenous peoples. In 1992, in a High Court decision akin to New Zealand's formal declaration of historic land rights, the Murray Island decision asserted that "Native Title" pre-existed prior to 1788 for community governance purposes, and rejected the use of "Terra Nullius" inferred in an earlier 1971 decision. Referred to as the "Mabo decision" after the trade union leader who had taken this case up to the High Court. Famously alluded to in "The Castle", a movie filled with Australia's talent at "sending itself up". Hobart (Van Diemen�s Land) was first in 1825, becoming a major penal colony for Britain until transportation finally ended for them in 1853. Self-government and the renaming of the island as Tasmania (thus removing that "demon" pun) followed in 1856. In Western Australia a small convict settlement was established at King George's Sound (Albany) in 1827, followed by an independent free settlement at the Swan River Colony in 1829, with its main town named as Perth. In 1831 Albany was incorporated into this colony, the convicts were returned to Sydney, and a boundary for Western Australia was set. However the colony had poor growth. In 1850, in order to boost its current white population of 5000 (and get more financial support from Britain) they ended up agreeing to becoming a penal colony until 1868. Self-government, with an upper and lower house, finally came to them in 1890. South Australia was created by a special act of Parliament in London in 1836 with its boundaries broken away from New South Wales, and sponsored free passage from England for four years, a free province, no convicts ever. Growth was rapid. Self-government came in 1855. Melbourne (Victoria) was next. Boundaries and independence from Sydney in 1851, and self-government in 1855. And lastly, but not leastly :-) Brisbane (Queensland), boundaries and independence and self-government in the same year, in 1859. Self-government throughout the colonies led to British military support ending, with the departure of the last British Army regiment in 1870. Click here for some of this history. However Britain's Royal Navy continued to provide protection for the waters around the continent until the establishment of the Royal Australian Navy following Federation in 1901. 7. Australian Capital Territory (Canberra) 408 thousand 8. Northern Territory 250 thousand. Click here to read some of South Australia and Adelaide and the Northern Territory's history, famous for a number of firsts and equal firsts, including secret ballots, the legalising of trade unions, and the Torrens title for land registration. Ok. Now for Brisbane and Queensland, initially the Moreton Bay settlement. Ethics/Ethical and Mores/Morals � Customs or character of a person or people. Ethical is from the Greek Ethos, Moral is from the Latin Mos/Moris, but basically the same word. Interestingly, according to this Greek Dictionary of New Testament words, the word ethnic is probably also derived from this word: click here Ethos/Etho. Indigenous � Born in the country � not a foreigner. However, because nearly 98% of us here in Australia are such recent arrivals the Australian Government defines indigenous Australian as either Aboriginal, Torres Strait Islander (or a mixture of the two). According to Wikipedia � click here � the number in 2016 that traced their ancestry back to one of those groups was 649,171. Whereas Indigent � Needy � very different word. Latin word indigens related to Greek word ενδεης (en-deh-ace). "Brisbane, my present capital, must resemble what Boston and the other Puritan towns of New England were at the close of the last century. In a population of 7,000 we have fourteen churches, thirteen hotels and twelve policemen. The leading inhabitants are a hard-headed set of English and Scottish merchants and manufacturers." Writing to the Secretary of State for the Colonies he also described himself as impressed by the air of prosperity. "Distress and pauperism, those comprehensive terms so frequently used in European politics, are unknown here." Despite this favourable view, it is recorded that one other visitor at another time was not so impressed. When he saw the hotels, he rubbed his hands with glee, saying this was the place for him to start in business. But then he counted the churches — and returned at once to Sydney. In 1770 James Cook named Moreton Bay (spelling it as "Morton"). A misprint, however, introduced the "e". In 1799 Flinders also explored the area, more closely. In 1822 John Bingle and William Edwardson explored in the area. But all these navigators missed any indication of a large river entering Moreton Bay. Thomas Pamphlett and fellow "ticket of leave" convicts Richard Parsons and John Thompson, along with full convict John Finnegan, were hired by settler William Cox to fetch cedar from the Illawarra District, the Five Islands, now known as Wollongong, south of Sydney. They set sail on their maiden voyage on 21 March 1823 in an open boat 29 feet in length and 10 feet in beam. On board were large quantities of pork and flour and five gallons of rum to buy cedar from the timber cutters, plus four gallons of water. They got to within sight of Illawarra when a strong breeze blew them away from the coast. The wind became stronger, heavy rain fell and it got dark. They were blown further out to sea. It was five days before they could use any sail, and they drank the water and the rum. Prevailing winds and currents may have taken them most of the way across the Tasman Sea toward New Zealand. They were hopelessly lost. In error, they thought they had drifted south to Van Diemen's Land (Tasmania) so they headed northwest to try to get back to Illawarra and Sydney. On their twenty-second day at sea, having survived on just rum and salty rainwater, Pamphlett spotted land. Before they could land, Thompson succumbed to the lack of fresh water and the elements, and collapsed and died. But scared of the natives they saw in their weakened condition, worried about wrecking the boat, arguing, they sailed north with his body for three days until, delirious with thirst, Thompson was dropped overboard, and the others landed, wrecking the boat. Pamphlett, Finnegan and Parsons had landed on Moreton Island, just north of the Brisbane River. Thinking Sydney was well to the north, they set off along the beach in this direction with two sacks of flour and a few other items. They spent the next seven and a half months walking around Moreton Bay, island hopping, and following river and creek banks until they could find a way of crossing them. They lived for periods with several Aboriginal tribes who fed them fish and fernroot and thought they were the ghosts of dead kinsmen due to their pale colour. The natives first took them south by boat to Stradbroke Island. Here the castaways made their own canoe and got to the mainland, where they landed near what is now Cleveland. They continued their journey northwards along the waterfront in hope of reaching civilisation. It wasn't long before the trio stumbled across a large river which they were unable to cross, the Brisbane River. They trekked upstream for almost a month, weakened due to lack of good food. With only one reasonable swimmer (Pamphlett), they had to follow the banks of many of the creeks they encountered en route. Upon reaching Oxley Creek near Tennyson, they found a canoe. The canoe was on the western bank of the north-south running creek, and was procured by Pamphlett swimming across the creek and bringing it back, though it could not support more than two of them. So they used the canoe, and another they saw on the north side of the large river, to finally cross it, return to its mouth, and continue north, reaching Bribie Island at the start of July 1823 where they stayed with a tribe for about a month. Then they set out again, north. At the Mooloolah River, Pamphlett was encouraged to return to live at Bribie Island with an Aboriginal friend whom he had helped, after he had extracted part of a spear that had been broken off inside his leg a month earlier. Parsons and Finnegan headed further north. The pair quarrelled, Parsons threatening to murder him with his knife, and Finnegan returned to Bribie Island to Pamphlett and the tribe. Parsons continued northwards. On 29 November 1823, Pamphlett and some Aborigines were on the beach at Bribie Island cooking the day's catch when he saw a cutter in the bay. It was explorer John Oxley who was returning down the coast, from two weeks at Port Curtis near Gladstone, looking for a new convict settlement. Oxley was amazed to see and hear a "lighter-skinned" man waving and hailing him in English with the natives, Pamphlett himself could hardly speak that evening, such was his emotion. But only then did Pamphlett learn that Sydney was over 500 miles (800 km) to the south rather than to the north. He told part of his story to crew member John Uniacke. Next day they picked up Finnegan who was returning from a tribal fight. Finnegan showed Oxley the Brisbane River hiding behind the mangroves and Fisherman's Island , while Pamphlett assisted Uniacke and others with aspects of Aboriginal culture. After Parsons returned to Moreton Bay, having as Parsons said later, walked for "hundreds of miles", he was picked up by John Oxley on his second trip with Alan Cunningham on their trip in Sep-Oct 1824 — the trip when John Oxley had breakfast at Breakfast Creek. Oxley, having sailed up the Brisbane River as far as Goodna in 1823, was adamant the bay and the river, was the place to start the settlement. Sep 1824: First convict settlement in Humpy Bong, Redcliffe with 29 convicts. But land found unsuitable for grain, also too much disease and mosquitoes. On November 23, Governor Brisbane arrived. In December preparations began for the shift into Brisbane with a storehouse built in present day William Street near the Queen's Wharf Rd, back then the King's Jetty, and slab huts for prisoners. Transfer made in May 1825. At the end of 1825, the population including the soldiers was 45 males and 2 females. Convict numbers increased rapidly, reaching 1,241 by 1831. Over the length of the convict period, 2400 convicts arrived, including 144 females. As a place for hardened criminals and repeat offenders the principal object of the authorities was the isolation of the settlement, approach to which within fifty miles was strictly prohibited to Europeans. So naturally there were no shops or banks. Fresh water came from a creek which rose near the present Brisbane Grammar School on Gregory Terrace and flowed down the site of Roma Street Parkland to the site of the present City Hall. A small reservoir dammed this creek and conveyed water through hollow hardwood logs. Corn, the first successful staple crop, was grown at South Brisbane, directly opposite the main settlement. 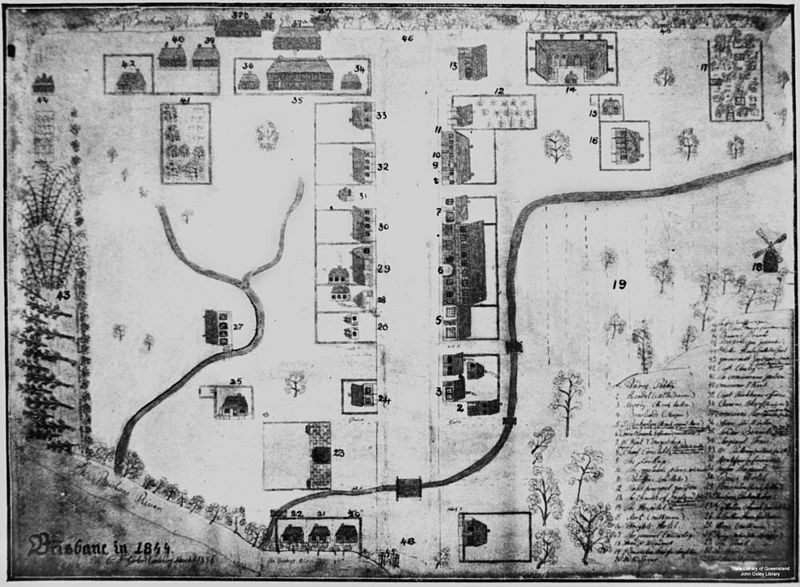 New Farm followed in 1827, Eagle Farm in 1829. 1827: Limestone Station (later renamed as Ipswich) provided the source of Brisbane's mortar for its convict hospital built in 1827, the male and female convict barracks in 1828-29, the Windmill to grind corn on Wickham Terrace in 1829, and the completion of the Commissariat Store which had begun in 1824. The convicts' hours of work were sunrise to sunset with two long breaks, one at 8am for breakfast and one at midday. On Sundays, they were mustered for a church service. Hundreds of convicts fled the stern conditions (of public lashings and at times executions) and escaped into the bush. The convict settlement was gradually reduced during the 1830's as the authorities prepared to open the Moreton Bay region for free settlement. 1834: With numerous stone structures now built, the Moreton Bay settlement was declared to be a town having the name of Brisbane being on the Brisbane River — that name had been given to the river by John Oxley when he explored it in Nov 1823, Sir Thomas Brisbane being the governor of NSW at that time. 1839: Penal settlement closed with convicts returning to Sydney. A number of convicts with guards remained to do maintenance and to assist surveyors. Click here for further details of this time. 1842: Brisbane was officially proclaimed a free settlement on 4 May 1842 with Brisbane now laid out in dusty, unsealed streets and blocks. A homeopathic surgeon, Dr Stephen Simpson was appointed commissioner of crown lands for the area and became acting administrator until the arrival of police magistrate John Wickham the next year. On 7 December the first Brisbane land sales (by auction) were held in Sydney. The same month saw the inauguration of the first steamship service by the Hunter River Steam Navigation Co. with the steamer "Shamrock", a three day journey between Brisbane and Sydney. Below is a map of Queen Street (though not to scale) with all its buildings and landmarks in 1844. Note that the map is facing towards the south west, with the Botanic Gardens (then known as the Government Gardens) on the left and the Windmill (on modern day Wickham Terrace) on the right. 48 First Tombstone (two graves) at the top right (left of 17) was very likely the burial place of the 3 or 4 children who died during the colony's early years. Both they and the many convicts and soldiers buried near them in the General Cemetery were apparently reinterred with their memorial stones in the Toowong Cemetery about 1881 in preparation for the new tramway. Andrew Petrie was an early builder and architect who became the Clerk of Works in the new settlement. His house on the right of Queen St at the bottom of the map (building number 1) is today's Aurora Tower on the corner of Wharf and Queen Streets. Opposite came Brisbane's first customs house built at Petrie Bight in 1850. Note, port facilities are now handled by the Port of Brisbane at the mouth of the Brisbane River, and with all customs border policy and taxation now handled in Canberra, this office was closed in 1988. Andrew Petrie's cousin George Edmonstone became the first butcher (and later on a mayor) in Brisbane. See Edmonstone's Paddock above (location number 19). Andrew's son John followed in his father's footsteps as a builder, and also became mayor, in early Brisbane. 1846: Brisbane declared a Port of Entry and Clearance. A cottage beside Andrew Petrie's house was set aside for William Duncan, first customs officer and his family. Estimated population is 4000 Aborigines and 2257 migrants. Brisbane now consisted of three villages, at North Brisbane, South Brisbane, and Kangaroo Point. Moreton Bay Courier, forerunner of the Courier Mail, commenced this year making frequent mention of local indigenous people who were working and living in the district. In December, Brisbane's first solicitor Robert Little arrived and set up an office in George Street, opposite the old hospital. Click here for a detailed record of the early years of his practice. In 1925 his firm became Feez Ruthning and Co and since 1996 part of Allens Operations Pty Ltd.
1850: The first bank, the Bank of NSW opened a branch for general (trading) bank business. During the 1850s the Commissariat Store, soon to be called the Colonial Store, had its first floor turned into an immigration barracks, and in the 1860s a police barracks. 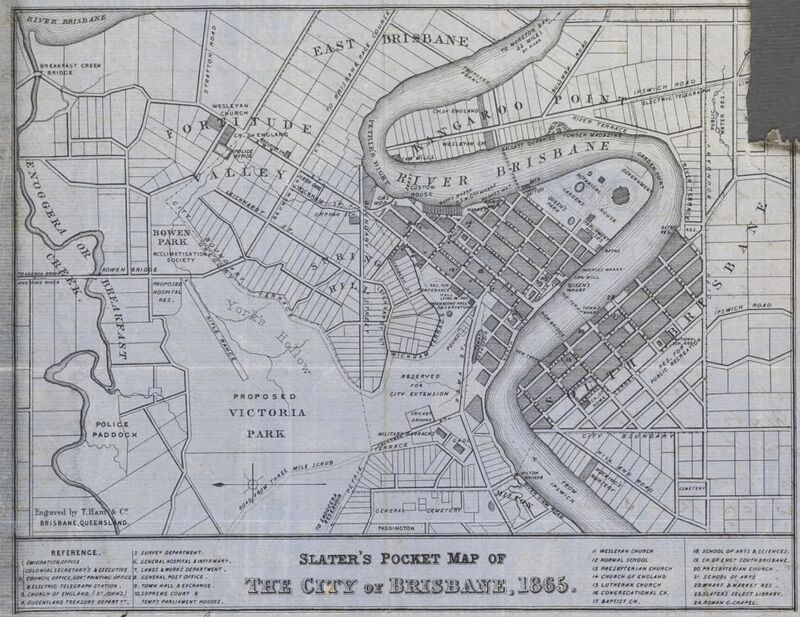 Below is Slater's pocket map of the city of Brisbane in 1865 as stored in the National Library of Australia. Click here to see its reference, with an option to download a much larger TIF file. York's Hollow (Victoria Park) was a humorous early settler reference to Daki Yakka, called the "Duke of York", being an aboriginal elder with a somewhat "regal" bearing. It was a time when there was a fair amount of animosity between black and white (still is, in some places). Despite community disapproval, prostitution outside the hotels by underage indigenous girls who were after smokes and drinks continued to increase. So, similar to the other colonies in Australia, starting in 1855 and lasting about 100 years, it now became illegal for indigenous peoples to venture inside the "boundaries" of the Brisbane settlement after curfew i.e. after 4pm in the afternoon or at any time on Sundays. The boundary was a fence-line along Boundary Street that separated the northern area from the built-up area south to the river. In South Brisbane it was Boundary Street in the west, Vulture Street in the south and Wellington Road in the east. Similar "boundary" streets were developed around other shires and towns. After 1897, many Queensland aborigines were forced to live on "protected" reserves, with many restrictions. For example, indigenous women were prohibited from marrying anyone other than an indigenous man without the permission of an Aboriginal Protector, with mothers having to put their children up for adoption. It was 1984 before all these laws were ended. Fortitude Valley was an early "boat people" place in 1849. The Fortitude and two other ships were ships chartered in England by 550 migrants after a Presbyterian minister who was also a member of NSW Parliament, Mr John Dunmore Lang of Lang Park fame, told them he had been given the promise of free pastoral land on their behalf by Governor Gipps, Gipps subsequently disavowing any such statement. In some desperation, tents were set up for them at York's Hollow (Victoria Park) by Captain Wickham in Brisbane, and gradually the migrants found themselves work, both in Fortitude Valley, and elsewhere. East Brisbane was shifted over the river when the East Brisbane tramway route and East Brisbane Bowling Club were set up at Mowbray Park on the south side in 1903-4. On the north side it resumed its earlier name of New Farm. Click here for a page with further information on renamed suburbs and streets in Brisbane. Slater's map was printed just after the Great Brisbane Fire in the evening of 1st December 1864, with entire blocks destroyed with their timber buildings, mainly in Queen, Albert, George, and Elizabeth Streets. Most fortunately there was no loss of life, and only four people were taken to hospital with injuries. Subsequently, the rebuilding of Brisbane City used more stone and brick. Next to Customs House in Slater's map can be seen Raff's Wharf, USN United Steam Navigation Company Wharf providing a mail service to Gladstone & Townsville and Market Wharf. Brisbane Markets opened in 1866 at Market Street as a major venue for where farmers could bring their merchandise to sell to cityfolk. Activity waned however, and after 1881 only the street name survived. 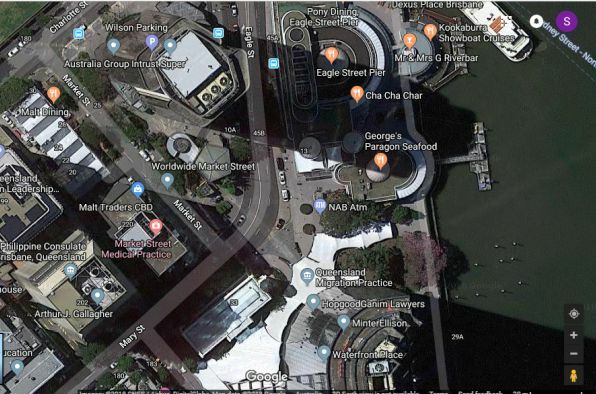 In 1885 Brisbane Markets opened at a more central location on Roma Street, that triangle of ground where Roma Street meets Albert Street at the corner of Turbot Street. A separate, competitive marketplace later opened on Turbot Street. 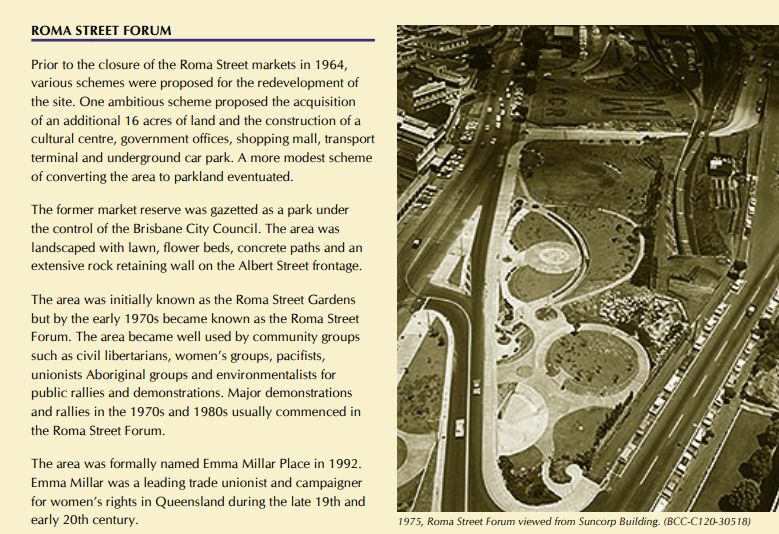 In 1964 the Brisbane Markets shifted to Rocklea and the Roma Street Markets became Roma Street Forum, and since 2001, Roma Street Parklands. Click here for a larger image. 1827: As mentioned previously, in 1827 a Convict Hospital was built on North Quay facing George Street between Adelaide and Ann Streets in this tiny convict town. In 1832 its accommodation was extended, a cottage was built for the Medical Officer, and a Military Hospital was built adjacent to it. It subsequently became the Survey Office. 1849: After free settlement, the first Public Hospital in Brisbane, the Moreton Bay Hospital, was established on 12 January, 1849. It was this old Convict Hospital on North Quay and was grossly overcrowded trying to cater to the growing population of post convict era Brisbane and surrounding areas. The hospital operated on subscriptions from those in the community who could afford to give. In turn these subscribers were issued with tickets which would entitle the bearer to medical treatment at the hospital. Those who could not afford the subscriptions and needing treatment went in search of tickets from benevolent subscribers. Another source of funds was the fines levied in the Police Courts. 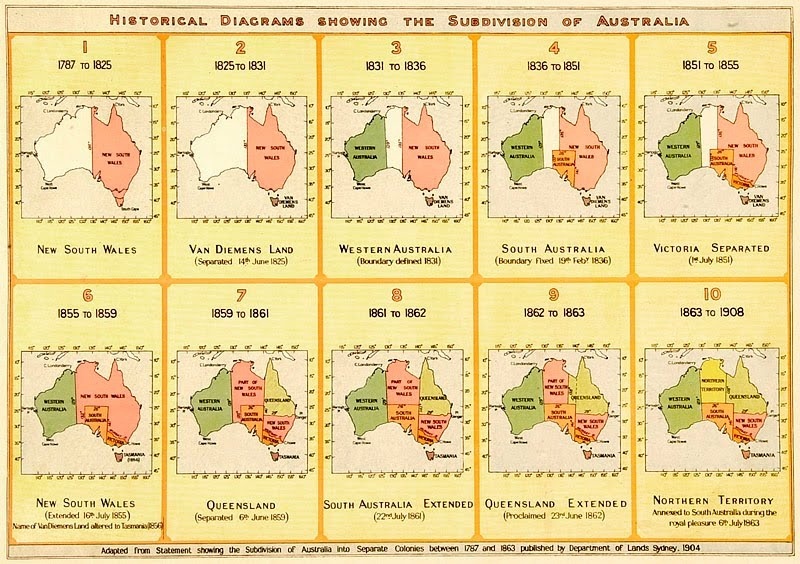 1856: Brisbane's non-indigenous population approached 6,000. The name of Moreton Bay Hospital was changed to the Brisbane Hospital as other hospitals in various towns opened. The opening of other hospitals meant that the subscriptions base dwindled and a call went out for more local subscribers. Epidemics of diseases brought in from the tropics swept through Brisbane such as malaria, dengue fever, typhus, typhoid, amoebic dysentery and smallpox. Gunshot wounds and knife injuries from numerous bar and street brawls requiring surgery, were on the rise. In the 1860s tropical diseases were introduced by the unfortunate South Sea Islanders or Kanakas, who were 'Blackbirded' and brought to Brisbane and northern Queensland where they were forced to work on cotton plantations and cane fields. The practice was outlawed by the Queensland Government in the 1890s and most Islanders were sent home. But it was a wild time all right. Click here re Patrick Mayne, the "mad" Irish butcher of Queen Street, at his death possibly one of the richest men in Brisbane. 1867: More than 35,000 flocked to Brisbane between 1860-1865, following separation from NSW in 1859 combined with the development of a proper immigration scheme, but with no support from the previous New South Wales government, the building of a larger hospital was delayed until the Queensland Government accumulated sufficient funds of its own. The new hospital was completed in 1867. Standing on land at Herston, the facility contained Fever Wards, long low blocks located just behind the main building. The patients were moved from the hospital in George Street to the new Brisbane Hospital on 8th January, 1867. There were complaints that the new hospital was located too far out of the town and would have been better sited at Spring Hill or Petrie Terrace. The first nurses graduated from the hospital in 1888. 1859: The Municipality of Brisbane was gazetted on 25 May 1859 and proclaimed by the Governor of New South Wales on 7 September 1859. The first local government area in Queensland, Brisbane was the only one incorporated prior to the establishment of Queensland as a separate colony. Its boundaries covered the Brisbane City area, and Fortitude Valley. The first election for this municipal council was held on 13 October 1859. There were 37 candidates for the nine positions on council. John Petrie, notable builder and stonemason, was unanimously elected first mayor. The first aldermen were men who had helped to establish Brisbane as an important settlement in the north. At the same time, Sir George Ferguson Bowen was appointed the first Queensland governor. He arrived at Brisbane from England on 10 December 1859 and brought Robert Herbert with him as his private secretary. On the day of the governor's arrival, Herbert was gazetted as colonial secretary with Ratcliffe Pring as attorney-general. These with the governor formed an executive council to which additions were made afterwards. At the election held early in 1860 Herbert was returned unopposed for one of the Leichhardt seats in the Queensland Legislative Assembly and became the first premier of Queensland. He showed himself to be a good leader, holding office from December 1859 to February 1866. Click here for background and photos of Brisbane's early water supply, in the days when people without rain tanks purchased their drinking water in casks. Click here for today's situation, with twelve dams servicing Brisbane and South East Queensland, having a combined total capacity of 2 trillion litres. 1863: The Qld Government commissioned the Brisbane Council, via a loan of £50,000 to construct waterworks and lay down pipes from the water supply at Enoggera Creek. 1866: Just as the work was nearing completion, the Qld Government took control away from the Municipal Council and appointed the Brisbane Board of Waterworks to run the service. 1902: Brisbane had an outbreak of bubonic plague which encouraged agitation for sewerage. 1909: Brisbane Board of Waterworks replaced by a newly constituted Metropolitan Water and Sewerage Board (MW&SB), to commence sewerage implementation. 1912: Brisbane's first water filtration plant installed at Enoggera dam. 1923: Finally, first sewerage connection in Brisbane — to the MW&SB office. 1925: The Qld Government now formed the Brisbane City Council amalgamating the two cities Brisbane and South Brisbane, six towns — Toowong Ithaca (i.e.Paddington and Red Hill) Windsor Hamilton Sandgate and Wynnum, nine shires — Moggill Taringa Enoggera Kedron Toombul north of the river, Balmoral Belmont Coorparoo Stephens (i.e.Annerley) south of the river as well as part of the shires of Yeerongpilly and Tingalpa. It reduced the number of aldermen over this area from more than 200 down to 20. 1928: Brisbane City Council formally took over responsibility for MW&SB assets. 1935: Qld Govt starts construction on building Lake Somerset on the Stanley River 37 kms west of Caboolture, a flood mitigation reservoir (60% of its capacity), and having the other 40% provide for 380 billion litres of drinking water. Due to WW2, it wasn't until 1959 that all work related to the dam, including its hydroelectric power station was complete. Two further dams followed, North Pine by 1976 and Wivenhoe by 1985. 1961: But in this year, Brisbane was still a city with no town planning, many unpaved streets, limited water supply, few areas with sewers — with most residents having to rely on having an outhouse or a septic tank. Through the 1960s Lord Mayor Clem Jones successfully led the council to develop a town plan, seal roads, improve drainage and connect sewers to most of the city. 1979: Brisbane's sewerage scheme essentially completed. 2010: The Qld Government resumes control of Brisbane Water, commissioning Qld Urban Utilities on behalf of SEQ Water to deliver retail water supply and wastewater services to Brisbane and South East Queensland. 1861: Queensland's separation from New South Wales created a position for Superintendent of Telegraphs which was filled by W.J Cracknell, the brother of the New South Wales Superintendent. Tenders were called for a line from Brisbane to the NSW border via Ipswich and Warwick. It was completed to Ipswich in April 1861 and working to the border by November 1861. This connected to a recently completed line from Sydney. Now four colonies were connected: Brisbane, Sydney, Melbourne and Adelaide. Lines were pushed out from Brisbane north to Bowen, Rockhampton, reached Port Denison in 1866, and Cardwell in June 1869. Perth was connected the same year. 1872: Connected to England click here via Adelaide / Darwin. Before the telegraph, news and mail could take three months to reach England, the telegraph reduced this to around seven hours. As the telegraph spread provincial and city newspapers published sections by-lined 'by Electric Telegraph'. Note, there was to be no railway bridge joining Brisbane and South Brisbane for nearly 100 years. Third, South Brisbane-Ipswich and South Brisbane-Beenleigh. Click here for more info on South Brisbane's rapid development at this time 1880-1890 as Brisbane and South Brisbane's population grew from 37,000 to 100,000. In 1888 South Brisbane became an independent sub-division, the Borough of South Brisbane, having its own town hall. In 1903, their accelerating populations caused both Brisbane and South Brisbane to be reclassified as cities (no longer as towns). 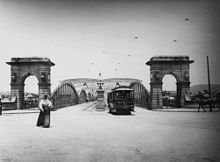 1865: First was a temporary wooden bridge built between Brisbane and South Brisbane (that used tolls) while Victoria Bridge was being built. Awkwardly in 1866, the Bank of Queensland which was financing the loan to the town council for the bridge, failed, and work stopped for a time. See section 5.2 on page 18 for more info on this bank. This wooden bridge, weakened by marine borers, then collapsed when a heavy load was crossing it at high tide and it closed in 1867. 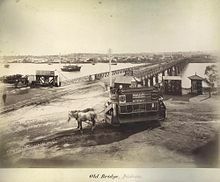 1874: Then, Victoria Bridge built (privately financed, with tolls to 1877). 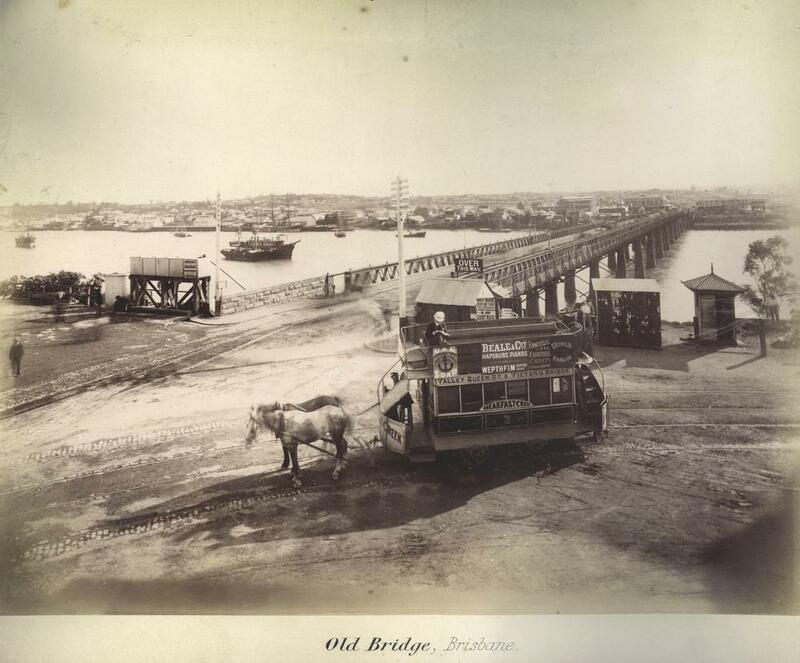 1875: Albert Bridge built as part of the Ipswich Railway Line between Indooroopilly (northside) and Chelmer. Rebuilt in 1895 after it was destroyed in 1893 floods. 1876: Victoria Bridge taken over by Qld Govt in 1876. 1885: Leased by the government to private company who provided a horse-drawn tram service. Eighteen tramcars imported from America. In the words of the "Brisbane Courier" of the day they "are constructed of cedar and mahogany, highly polished, and are fitted with all the latest improvements. They are mounted on steel springs, making the motion almost imperceptible." Drawn by two horses, the single deck cars seat 16 passengers and the double deckers 40. Six and a half miles of double track constructed from Woolloongabba to Breakfast Creek with branches to the Exhibition Building and to New Farm. 1893: Bridge demolished in 1893 floods. Temporary bridge rebuilt. Swept away again in 1896 after another deluge. 1897: Second, more permanent Bridge built. Included in the rebuilding, an electric tram service. 1932: William Jolly (Grey Street) Bridge built. 1936: Walter Taylor (Indooroopilly) Bridge. Tolls until 1960's. 1940: Story Bridge built linking Kangaroo Point southside with Fortitude Valley. 1955: Indooroopilly Railway Bridge built between Indooroopilly and Chelmer, upstream of Albert Bridge, as a quadruplication of the Ipswich line 1955-1957. 1964: Centenary Bridge built between Kenmore (northside) and Jindalee. One of its two lanes was closed for two years in 1974 after the bridge was damaged by a barge during the 1974 floods, with traffic lights necessary to co-ordinate single-lane traffic. In 1987 the bridge was duplicated, providing two lanes going north and two lanes going south. 1969: Victoria Bridge rebuilt (yet again). 1972: Captain Cook Bridge built as part of the Pacific Motorway (M3) linking Woolloongabba southside to Gardens Point. 1978: Merivale Railway Bridge built slightly west of the Grey Street Bridge. 1986: Gateway Bridge built (with tolls) linking Murarrie (southside) with Eagle Farm and the airport. 1998: Jack Pesch Bridge built for pedestrians and cyclists linking Chelmer southside to Indooroopilly. Adjacent to Albert Bridge (for trains) and Walter Taylor Bridge (for cars). 2001: Goodwill Bridge built for pedestrians and cyclists linking the South Bank southside to Gardens Point. 2006: Eleanor Schonell Bridge (Green Bridge) built for buses, pedestrians and cyclists linking Dutton Park busway station southside to UQ Lakes busway station. 2009: Kurilpa Bridge built for pedestrians and cyclists linking Kurilpa Park and Gallery of Modern Art on Montague Road southside to Tank Street. Click here for map. 2010: Go Between Bridge built (with tolls) to honour Brisbane band the Go-Betweens, linking West End (southside) with Hale Street Milton and the Inner City Bypass. The Royal National Agricultural and Industrial Association of Queensland (RNA) was established in 1875 with Governor Sir William Cairns as its President. Bowen Park was chosen in January 1876 as the site for the first Show. The 'Intercolonial Exhibition of 1876', held from August 22-26 proved a great success. A public holiday was declared and an estimated 15,000-17,000 people attended the opening day - a great feat at a time when the total population of Brisbane was just 20,600. The RNA Showgrounds now become the centre of the city's social activities-musical and drama groups, football, cricket, lacrosse, athletics and cycling all had headquarters on grounds. In 1887, the Main Pavilion (corner of Bowen Bridge Road and Gregory Terrace) was destroyed by fire. In 1891, it was replaced with a new brick building, containing 1,300,000 bricks and completed in 23 weeks. 300 men were constantly at work during its construction. This building was equipped with a huge pipe organ by Wallis and Co of London, though it was later moved to the Brisbane City Hall after its completion in 1930. Prior to 1882 in Australia, the telegraph and even the new telephone were in use, powered by an electric battery. A battery could also be used to power a carbon arc lamp, but these were a difficult sell to customers because the batteries were not reliable, very expensive, and had a short life. Then, early in 1882, electric lighting (using a DC steam-engine powered dynamo) was installed in Sutton's Foundry on the corner of Adelaide Street and Foundry Lane (later renamed as Isles Lane — Post Office Square). In December that year a large crowd gathered near Victoria Bridge to witness the first demonstration of public street lighting. Eight arc lamps were positioned between Eagle Street and Victoria Bridge. The lights were powered by a 10 hp (7½ kW) dynamo situated in Sutton�s Foundry. Several Queen Street shop windows were also lit by electric light as part of their Christmas decorations. Note, the only cities in the world that had similar installations in that year were New York and London. In 1883, lighting was installed at the Govt Printing Office, and in 1884 at The Brisbane Courier. In 1886, the laying of underground cable between Parliament House and the Govt Printing Office was complete, with Toorak-born Mr E.C. Barton, as Queensland Government's electrical engineer, supervising the laying of the cable. Prior to his return to the Southern Hemisphere this man had apparently superintended the first commercial electric-lighting system in Britain at Godalming Surrey in 1882. Now, in 1888, forming a company with Mr C.F. White, he built a power house in Edison Lane behind the Post Office with a 30 kW generating capacity. Barton and White then became the first electricity supply company in Australia, with the Brisbane Post Office their first customer. Adjoining shops were supplied by overhead wires, the first non-government customers. Unfortunately his firm shortly went bankrupt and was succeeded in 1894 by his Brisbane Electric Supply Co Ltd, then in 1904 by City Electric Light Co Ltd (CEL). In 1897, Brisbane Tramway built Queensland's first significant power station at Countess Street in Brisbane, initially at 900 kW, boosting it to 4.05MW by 1915. Some places in Red Hill and Ithaca also receive supply from this private company. Click here to read more about the Tramways below. In 1914 E.C. Barton meanwhile converts his company CEL from DC to AC. After World War One, electricity supplies proliferated statewide and nationwide. In 1928, the New Farm Powerhouse was built by the Brisbane City Council, who had acquired the Brisbane Tramway. The Countess Street power station was decommissioned. The New Farm Powerhouse, in addition to supplying Brisbane Tramway, now allowed for the construction of an 11 kV network to supply power for electric light to greater Brisbane. Previously CEL had supplied power to residences under 10 year orders, but with Council having this new powerhouse, they slowly inherited these new areas of supply as each order expired. By 1935, only the old City of Brisbane and City of South Brisbane were being supplied by CEL, with the rest of greater Brisbane, as well as the Tram Lines, supplied by the BCC Electricity Supply Department. In 1938, the State Electricity Commission Qld (SECQ) was established to coordinate electricity distribution state wide. It quickly strengthened CEL by actively ensuring that all the other electricity undertakings in South East Queensland were absorbed into the one entity. By 1940, CEL had acquired the generating and distribution assets at Ipswich, Southport, Nambour, Coolangatta, Gympie, Redcliffe, Boonah, Beaudesert and Highfields, and the Tweed Shire in northern New South Wales. This created a situation where the two electricity providers in South East Queensland were the BCC and CEL. These two systems were connected in 1940 as a wartime contingency. In 1945, seven state boards were established: 1.SEQEB, 2.SWQEB, 3.Wide Bay�Burnett, 4.Capricornia, 5.Mackay, 6.North Queensland (NQEB), and 7.Far North Queensland Electricity Board. In 1953, the SECQ formed the Southern Electricity Authority (SEA) which then acquired CEL. It also acquired the Tennyson Power Station, under construction by the Brisbane City Council. 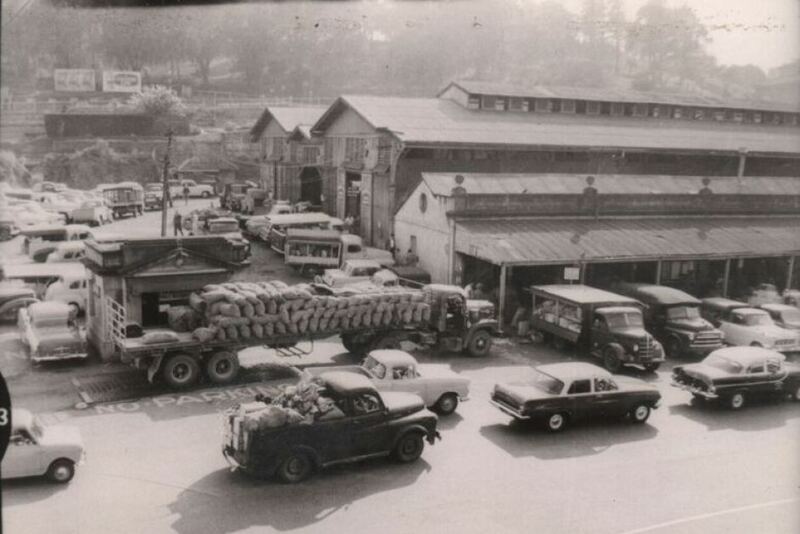 The New Farm Powerhouse remained under the ownership of the Brisbane City Council until it was sold in 1963 to the SEA. It was then decommissioned in 1971, with BCC's closing of Brisbane's Tram Lines. 1977 SEQEB becomes electricity supplier for all of South East Queensland (including Brisbane). Now the state board, not the city council, is in charge of meter reading and supply. Qld Government Owned Corporations (GOCs) — as SEQEB became Energex. Retailing of electricity supply Australia-wide is now managed by private corporations, the two largest retailers becoming Sydney-based companies Origin Energy (previously known as Boral) and AGL Energy. 1895: On 30 September, a company newly formed in London, called the Brisbane Tramways Company Limited, purchased Brisbane's horse car tramway system for £105,200 with the intention of converting it to electric operation and extending it. The electrical equipment for the tramcars was ordered from the General Electric Company of America who sent Mr J. S. Badger to install it. He remained in Brisbane for 27 years, most of the time as General Manager and Managing Director of the Company. 1897: The first electric tram runs along Stanley Street South Brisbane on June 21 with service to Queen Street coming 12 days later. All in all there were 20 tramcars running on 15 miles of track, electricity being supplied from a power station in Countess Street. Over the next 25 years tram lines extended to Toowong and Kedron north of the river, Dutton Park and Greenslopes south of the river, with Mr Badger inaugurating band concerts and picture show outings on summer evenings. 1912: General Strike called in Brisbane on 30th January after Mr Badger had refused tram workers the right to wear their union badges to work and dismissed the workers who refused to comply. Escalated rapidly with 25,000 workers marching through Brisbane on 31st January in protest. Within a few days the Strike Committee became an alternative government, with State Government departments and private employers needing the Strike Committee's permission to carry out any work. Lasted five weeks. The conservative Denham State Government immediately won an ensuing election on a "Law and Order" platform and passed the Industrial Peace Act of 1912 that ushered in compulsory arbitration specifically to deter strikes in essential services. Employees of the tramway company who struck were sacked with the tramway company refusing to ever re-hire the workers. Yes, a standoff with everyone pretty cranky. 1922 Qld State Government oversees purchasing of the company with its infrastructure for just over £1,000,000, and then reinstates these sacked workers. 1925: As mentioned previously, the Qld Government now formed the Brisbane City Council amalgamating the two cities Brisbane and South Brisbane, six towns — Toowong Ithaca (i.e.Paddington and Red Hill) Windsor Hamilton Sandgate and Wynnum, nine shires — Moggill Taringa Enoggera Kedron Toombul north of the river, Balmoral Belmont Coorparoo Stephens (i.e.Annerley) south of the river as well as part of the shires of Yeerongpilly and Tingalpa. Citywide electric Tram services greatly expanded. Interestingly, badges on tram and then bus uniforms — the cause of the strike — were forbidden and were to remain forbidden until 1980. 1926: Extended to Holland Park. It was NSW Governor Fitzroy who set up the National Education Board in Sydney in 1848. Apparently a lot of what he did was based on the multi-denominational National Schools in Ireland (set up in 1831), and he brought out a large number of Irish readers (there not being any Australian reading books printed at the time) . Click here, re our first Queensland readers. In 1850, a primary school following this NSW system opened in Warwick East and a second school in 1851 in Drayton Toowoomba. In early 1860, the National Board, later that year to become the Qld Board of General Education opened the Brisbane National School in Adelaide Street in a new building close to what is now Anzac Square. The first Headmaster was John Rendall and on the opening day the attendance was 50 boys and 8 girls. It was conducted as a mixed school until 14 August 1860 when the girl pupils were (temporarily) moved to an old wooden chapel at the corner of Ann and Creek Streets, forming the Brisbane Central Girls' School for girls and infants under its Headmistress Margaret Berry. In December 1862 the school moved back to that building in Adelaide Street, with the Boys School — now also known as Brisbane Normal School with a training school for teachers — moving next door to a new building on the corner of Adelaide and Edward Streets. Normal schools — derived from the French "Ecole Normale" provided a model curriculum that the government expected of all its public schools, with teachers trained accordingly to follow the model, the "norm" when providing education. Within five years many public (and a few church) primary schools had opened in Brisbane and Ipswich. Schools also opened in Dalby and Gladstone in 1861, Rockhampton Central Boys (now closed), Maryborough and Leyburn (SW of Toowoomba) in 1862, Gayndah and Condamine in 1863, Laidley South (now closed) and Goondiwindi in 1864, Toowoomba South and Bowen in 1865. Boys Grammar schools, that majored on the classical subjects such as Latin and which also provided accommodation for boarders, opened starting with Ipswich Grammar in 1863, Brisbane Grammar in 1868, and Toowoomba Grammar in 1877. Girls Grammar schools, somewhat of a novelty at the time which also provided accommodation for boarders, opened starting with Brisbane Girls Grammar in 1875. One of its headmistresses formed the private Brisbane High School for Girls in 1899 — later to be known as Somerville House after 1918 under a newly formed Presbyterian and Methodist Schools Association (PMSA). Back to Brisbane Normal School. In 1870, fees to the school were abolished. While there seems to have been little regularity in the amount (or collection) of these fees, their collection (as high as one shilling per week per child) seems to have also encouraged irregularity of attendance. In 1875, the same year as England, primary education for children was made compulsory from ages 6 to 12. The year in which you turned 6 then generally became Grade 1, and the year you turned 13 generally became Grade 8, though children could be one year older. Note too, this compulsory provision was not fully implemented until 1900. In 1912 the minimum school leaving age became 14 years. If you were academically bright, you might win a scholarship to further your secondary education, but until the 1950's and 1960's building "free" high schools in Brisbane just wasn't a priority for the State Government. After 1912, free state schools generally included teaching up to Grade 8, but that was it. A handful of country seats got looked after, having proper free high schools, but in Brisbane there was only Brisbane State High School (started up in 1921), with Wynnum State High not being built until 1942. The early beginnings to the Central Technical College which became Brisbane State High School, started in 1849 with the Brisbane School of Arts, built on the corner of Queen and Creek Streets. It provided a library for members, conducted public lectures, and organised classes in a wide variety of subjects. In May 1878 it shifted to a redeveloped building (having verandahs) on Ann Street. To meet the needs for technical education classes, a hall was added to the rear in 1884. This became the Brisbane Technical College which operated under the auspices of the School of Arts until 1902 when the Queensland Government took over responsibility for technical education, with buildings to be built at lower George Street near the Botanical Gardens (today known as QUT). Back then it also became the site for the University of Queensland. In 1910 the first University teaching faculties were ready. These included engineering, classics, mathematics and chemistry. In 1911 the first students were enrolled, using the Old Government House on George Street for the lectures. High School classes were commenced in 1913 when headmasters in various metropolitan state schools were asked to nominate 76 boys and girls for free admission to the newly formed Central Technical College with Brisbane Technical College merged with South Brisbane and West End Technical Colleges, along with a further 70 paying students who thus made up its first year's enrolment. Marianne Bryden, an educationist with many years experience, was supervisor for three years. There was still insufficient room in the George Street buildings, so classrooms were provided at the School of Arts in Ann Street for one year, then the expanding college moved into the buildings (finally finished). Also started in 1914 in those buildings was the Queensland Teachers' Training College, the fore-runner of Kelvin Grove Teachers College. In 1918, the Central Technical College formed the Greater Public Schools (GPS) Association along with the three Grammar schools Brisbane, Ipswich, Toowoomba and five Church schools Gregory Terrace (Catholic), Nudgee College (Catholic), Southport School (Anglican), "Churchie" Grammar (Anglican) and BBC (PMSA). It provided an environment for "healthy competition" in their sporting and cultural activities. A similar association for girls was the Queensland Girls' Secondary Schools Sports Association. In January 1920, the Brisbane Central Secondary School was established at the Brisbane Normal School with Isaac Waddle as headmaster, combining the secondary departments of the Boys School and the Girls school while establishing a state curriculum model. The scope of its instruction that year was limited to studies necessary for the Junior Public Examination. During the year, the name was changed to Brisbane Junior State High School. In 1921 it took over responsibility for all the High School classes at the Central Technical College, also amalgamating the High School Department at Wynnum State School. It now reconstituted as Brisbane State High School or BSHS, having its curriculum extended to include Senior Public Examination and Matriculation subjects. In 1925, with its new buildings now finished, it shifted to its current site in Musgrave Street, South Brisbane and in 1930 replaced Central Technical College's name inside the GPS Association. In 1927 the Brisbane Normal School (Adelaide Street) closed for demolition. All of its primary teachers and students were now at Leichhardt Street State School, built back in 1875. The Leichhardt Street school also took over the Normal School's role of training teachers, becoming unofficially known as the Central Practising School. In 1954, the school was officially renamed as Brisbane Central State School. Since 1950: With a steadily growing population, many more free High Schools have been built in Brisbane's suburbs and in Queensland country cities and towns. In 1964 the minimum leaving age in Queensland became 15 years. The same year, Queensland primary schools lost their Grade 8 year, it became part of regular high school. Current School Leaving Age: In 2006 it became 16 years, or to have completed Grade 10. In 2009 it became 17 years or to have completed Grade 12, though 16 years is still acceptable if you have a minimum 25 hours employment / education weekly. Very recently, in 2015, Queensland primary schools lost their Grade 7 year, it is now part of regular high school. Click here for a fully merged list of all current Queensland Schools as at 18 May 2018, sortable by name, and by date opened. If sorting, wait a few seconds for the result, as it is a large list. Click here for the Wikipedia lists on which it is based, having numerous subdivisions by geographical area. The Valley Pool is the home of the powerhouse Commercial Swimming Club (founded 1903) that spawned Kieren Perkins, Libby Trickett, Susie O�Neill, Hayley Lewis, Samantha Riley and many other Olympians. Click here for an interview with two of its recent members: Bronte and Cate Campbell — world record holders in the 100m freestyle, and the 50m freestyle. Brisbane's first Town Hall on Queen Street, with its foundation stone laid in 1864, was completed in 1867. With huge growth during this decade, South Brisbane became a separate municipality in 1888. Its Town Hall was completed in 1892. By this year though, the municipality was being referred to in the Brisbane Courier newspaper not as a town but as a "city". In 1903, the Queensland State Government officially named the separate Brisbane municipality as a "city". In 1925, the Queensland State Government amalgamated these two separate cities, plus surrounding towns and shires, into the greater City of Brisbane. Brisbane's City Hall on King George Square, started in 1920, was then opened in 1930. In 1982, the Queen Street Mall was built for the Commonwealth Games in Brisbane. Road traffic through Queen Street became no longer possible as Queen Street was closed between Albert and Edward Streets. In 1988 and World Expo, the Queen Street Mall was extended from Albert Street to George Street, plus an entrance and exit at Victoria Bridge to the Queen Street Bus Station at the time the largest underground diesel bus station in the world. In 2008 the Queen Street Mall was extended again along Albert Street between Queen Street and Adelaide Street. 2019: 2½ million with Queensland at 5 million (estimate). Since 1971, Greater Brisbane has steadily stretched to a distance of 200 kms that now includes Brisbane north to Caboolture and Kilcoy, west to Laidley and Esk, south to Boonah, Beaudesert and Beenleigh, but excluding the Sunshine Coast and the Gold Coast. Tank Street, Turbot Street that becomes Wickham Street in Fortitude Valley, Elizabeth Street and Margaret Street all one-way (towards north-east) noting that Margaret becomes Felix Street before it becomes Mary Street. noting that William Street has been closed to all unauthorized traffic between Elizabeth and Margaret Streets until 2023. George, Albert and Creek Streets one-way (towards north-west) with George and Albert streets currently two-way between Charlotte and Alice Streets.